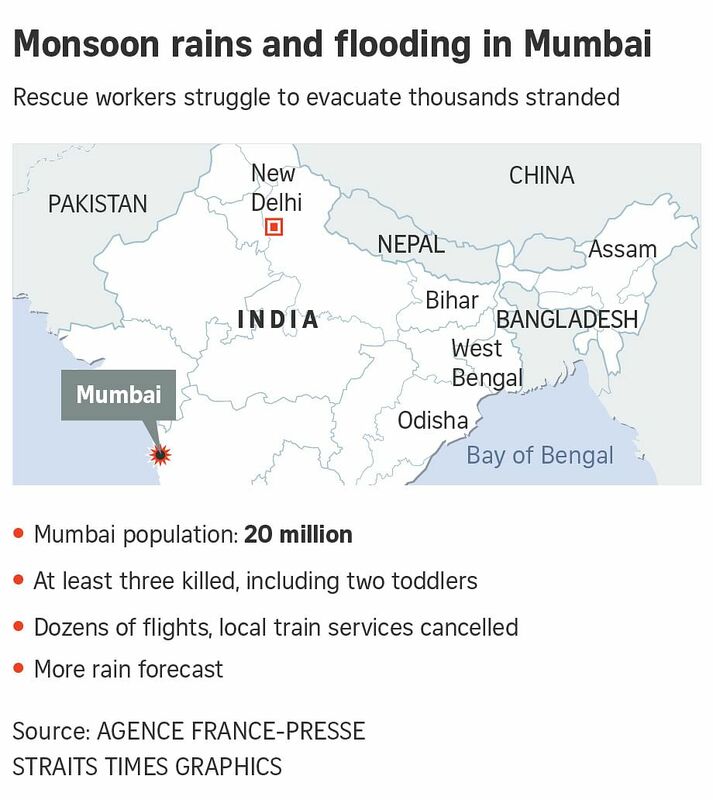 Mumbai is flooded with rainwater, causing at least six deaths and stopping transport throughout the city. MUMBAI (AFP) - Heavy rain brought India's financial capital Mumbai to a virtual standstill on Tuesday (Aug 29), flooding streets, causing transport chaos and prompting warnings to stay indoors. Dozens of flights and local train services were cancelled as rains lashed the coastal city of nearly 20 million people. Floods have killed more than 1,000 people in India, Nepal and Bangladesh in recent weeks and forced millions from their homes in the region's worst monsoon disaster in recent years. As the meteorological department warned that the Mumbai rains would continue for the next 24 hours, many offices sent staff home early, fearing a repeat of 2005 floods that killed more than 1,000 people. "I haven't been able to travel and had to cancel all my plans," said researcher Rajesh Prabhakar, who was stranded on the outskirts of the city after flooding forced the cancellation of rail services. "Many of my friends are stranded at railway stations... this is a reminder of the 2005 floods." Environmentalists blame frequent flooding in Mumbai on unscrupulous development that blocks drains. Electricity, water supply, communication networks and public transportation were totally shut down during the 2005 catastrophe. India's National Disaster Response Force said it was taking all precautionary measures.